Ristorante del Cambio is a gorgeous Grande Dame of a restaurant that offers romance, history and excellent Piedmont cuisine, where guests are transported back in time to a very elegant and gracious age. 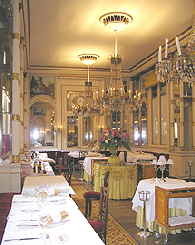 The Ristorante del Cambio, (www.THI-Hotels.com), in Turin, Italy was built in 1757, was expanded in 1859, and has been in continual operation since 1859. 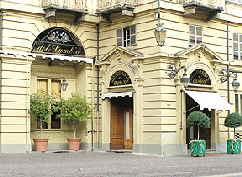 Turin Hotels International (THI) (www.THI-Hotels.com) has owned the restaurant for the last fifteen years. It received a Five-Diamond Award by The American Academy of Hospitality Sciences (AAHS), (www.StarDiamondAward.com), and it is a gorgeous Grande Dame of a restaurant that offers romance, history and excellent Piedmont cuisine, where guests are transported back in time to a very elegant and gracious age. The courteous wait-staff are impeccably dressed in tuxedos, and the splendid dining room has three ornate crystal chandeliers, sensuous crimson velvet banquettes with hand-crocheted white lace edging, gilt mirrors on the wall, as well as paintings by Robert Bonelli. Edward F. Nesta and I had a wonderful lunch at the restaurant in October 2004, where we sampled some of Chef Giuseppe Fonsdituri’s Piedmont region’s specialties. The day that we were there, the tables were draped with white linen, and there were pink roses in silver vases on every table. Turin was the first capital of Italy, before they moved it to Rome, and as such, it is a place that has attracted politicians, celebrities, as well as company executives throughout the years, and the day that we were there we saw three of Turin’s Juventus soccer players. After an excellent aperitif of sparkling wine, we began with pumpkin soup with rice, and a bean and pasta soup. The delicious pumpkin soup had small-diced pumpkin and potatoes, as well as wild rice in a rich broth. The hearty bean soup had pureed, as well as whole beans, with tagliatelle pasta and was drizzled with olive oil. For our next course, we selected the Russian salad, which was a delightful combination of tuna fish mixed with mayonnaise, potatoes, peas, carrots, olive oil and lemon juice. We followed that with delicate artichoke ravioli in a creamy sauce and garnished with shaved fried Parmigiano Reggiano cheese, and the Fritto Misto, a Piedmont specialty which arrived on a platter and held a large assortment of batter fried items including slices of apples, zucchini, mushrooms, liver, chicken, sausage, lamb, as well as white and dark chocolate. For dessert, we sampled a few of their many desserts, including marron glacés, panacotta and bonet. After our dessert and espressos, we toured the extensive 900-bottle cellar with Sommelier, Enzo DiLauro. He explained that the dirt floor wine cellar has remained the same since the restaurant was built, and that the dirt floor helps to maintain the humidity in the cellar. They turn the dirt over with a shovel as needed in order to maintain the proper humidity level. 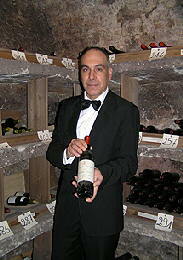 Mr. DiLauro has worked at the restaurant for five years, and knew all of the intricacies of their vast collection housed in different rooms, including wines from the Piedmont region, which make up the majority of their wines, followed by Toscana region wines, and their International wine room. The oldest bottle in their cellar is a Riserva ACI Marsala Superiore, which dates back to 1840. Perhaps we will have to sample that on our next trip to the restaurant! Read our article in our Chefs’ Recipes section where Chef Giuseppe Fonsdituri of the Ristorante del Cambio graciously shares his recipes with Luxury Experience for his Agnolotti Alla Piemontese, Braised Veal with Barolo Wine, and Bonet Langarolo.